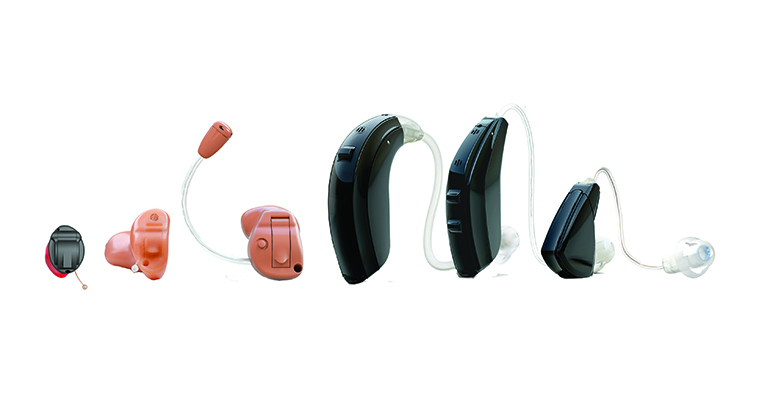 Hearing aids come in a variety of shapes, styles and technologies. Which one is right for you? That answer depends on your individual hearing loss and your personal listening needs. We will work with you to determine the very best solution for you, your lifestyle and your budget. The main section of this hearing aid is hidden behind your ear and connected to a molded receiver that fits snugly in the outer ear. Suitable for: all types of hearing loss. Custom in-the-ear models are custom made to fit the contours of your ear canal. They’re easy to insert for all levels of dexterity and avoid conflict when wearing glasses, hats, etc. Depending on the specific type, it may be more or less invisible in your ear. The size and shape of your ear canal along with your specific hearing loss determine which type of custom hearing aid is right for you. Suitable for: mild to moderately severe hearing loss. Remote Microphone is a new category developed by ReSound that combines the advantages of the behind-the-ear and custom (in-the-ear) models. The microphone has been moved to the outer ear and is connected to the main body of the hearing aid by a thin transparent tube. The result offers open-fitting comfort and maximum wind noise suppression. Dennis Horsman, Board Certified in Hearing Instrument Sciences, has been caring for people with hearing difficulties in the mid-Missouri area since 1999.